Are NSAIDs the best pain relief for horses? Veterinarian Elizabeth Davis looks at the properties and pitfalls of the use of non-steroidal anti-inflammatory medications (NSAIDs) in horses. NSAIDs are a class of agents best recognized for anti-inflammatory and analgesic (pain suppression) properties. An important clinical use of this class of medication is to improve patient status and minimize pain. The NSAIDs are a class of medication that were originally used in veterinary medicine in 1875. Indications for use included the control of fever, inflammation with pneumonia, and lameness associated with arthritis. The mechanism of action for NSAIDs is important to understand, particularly when we consider the use of several of these agents concurrently (stacking) and recognize that many of the agents used in equine medicine target the same enzyme system. This is why stacking or high-dose NSAID therapy may lead to drug toxicity. The fundamental principle of these medications is to inhibit the enzyme called cyclooxygenase (COX). What we have learned in the past two decades is that there are several forms of COX (1, 2, and 3) and some medications target one enzyme, preferentially. The NSAIDs described in this discussion will focus on general COX inhibitors; those that target COX2 preferentially are typically referred to as the coxibs and are beyond the scope of this discussion. Cell membranes contain a fatty substance called phospholipid. When a degradative enzyme called phospholipase acts on phospholipid, arachidonic acid (AA) is released. Arachidonic acid is then acted on by COX (1, 2, or 3) to produce substances such as prostaglandins and thromboxanes that have direct effects on local tissues and blood clotting; under inflammatory conditions the release of these prostaglandins can lead to pain, redness and swelling. The goal of NSAID therapy is to reduce the action of COX on AA and therefore limit the inflammatory response. One thing to keep in mind though, is that the presence of some COX (in particular COX1) is a good thing! COX 1 continuously allows for the production of “good” prostaglandins that help to keep the gut healthy (mucous and bicarbonate secretion) and an abundant amount of blood supply to the kidneys and other tissues. COX 2 and 3 are associated with situations where pain or disease are present and increase the pain and inflammation associated with these conditions. This is why NSAIDs that are marketed as COX2 inhibitors may provide improved patient safety, even though there are potential side effects with these medications as well. For many of the standard NSAID agents we have known information about dosing and safety of administration. For instance, we know that at a standard dose of 2.2-4.4 mg/kg by mouth once or twice daily (1-2 grams for the average 1000 lb. horse) there are few clinical complications. However in a case series that was reported in 1995 by Cohen et al, 5 horses were managed for a condition of NSAID toxicity where ulcers developed in their large intestine (right dorsal colon). An interesting component of this series included the detail that most horses were treated with standard doses of phenylbutazone and had complications with this treatment. From this published report we learned that even at acceptable dosages (legal with many performance horse organizations) we can still have complications with NSAID administration. 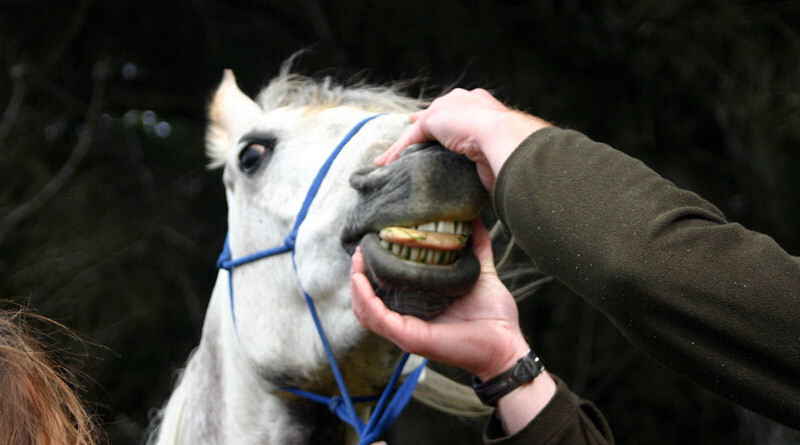 Complications commonly present as horses with a reduced appetite, gastric ulcers, loose stool, and changes on their blood analyses, such as low white blood cell counts and low protein levels (albumin). In an investigation performed in 2004 Foreman et al compared the effects of flunixin meglumine (Banamine) and ketoprofen with phenylbutazone and ketoprofen. Both flunixin meglumine and phenylbutazone were more efficacious for pain relief than ketoprofen. Interestingly, flunixin and phenylbutazone administered concurrently were not more efficacious than either alone, yet they were superior to saline and they were better than a very powerful positive control narcotic agent (meperidine), which suggests that stacking NSAIDs may provide a very high level of pain control in some settings that could be undesirable to the patient (mask pain that would prevent further injury). Phenylbutazone and ketoprofen demonstrated synergy even though phenylbutazone and flunixin meglumine were not synergistic. More recently it was reported by Foreman that when horses were tested for the efficacy of flunixin meglumine and phenylbutazone (alone and in combination) and were compared to saline the combination of flunixin meglumine and phenylbutazone were not superior to flunixin alone. In a report by Keegen et al the clinical efficacy of phenylbutazone was compared to the combination of phenylbutazone and flunixin meglumine administered concurrently. The model of analysis involved having horses examined for soundness while they were maintained in an exercise program. Interesting information was learned from this investigation, which confirmed that NSAIDs improved soundness in some horses, but those with significant disease were not consistently completely resolved with the combination of medications. An unfortunate fatal outcome of this investigation involved the loss of one of the horses in the combination treatment group to severe ulcerative colitis as a result of NSAID toxicity. The data generated from this investigation highlighted the fact that even at high doses NSAIDs may not completely resolve serious musculoskeletal pain and the risk of an adverse event increases when higher doses of NSAIDs are administered. The most recent study that examined the use of high-dose phenylbutazone in healthy horses revealed valuable information regarding the effects that these medications can have on equine patients. At high doses (either one agent at a high dose or stacking multiple NSAIDs together) adverse events can occur such as ulcerative colitis. Although the horses were apparently healthy in the early stages of this investigation with a good appetite and normal demeanor as early as three days after the initiation of high dose phenylbutazone administration, pathologic gastrointestinal lesions were developing. Overall, changes in blood tests showed reduction in white blood cell counts and protein (albumin) concentrations, changes in blood flow to the right dorsal colon and alteration in fatty acid production. This investigation highlighted the need for careful monitoring (clinically and with blood test analysis) of horses that receive NSAID agents. In conclusion, it is important to recognize that NSAIDs are an important class of medication for use in equine veterinary patients, particularly those that suffer from musculoskeletal pain and inflammation. But when used for an extended period of time, frequently, or at high doses (alone or in combination) the risk for adverse outcome exists. These adverse effects can be performance limiting in the case of gastric ulcers or can be life threatening in the case of right dorsal colitis. Therefore, when performance horses have a need for NSAID therapy it is important to have a careful veterinary examination performed to determine the source of pain. Once the lameness has been definitively diagnosed, veterinary recommendations should be carefully followed. In many cases adjunct therapy such as shoeing modification, injection of joints that may be affected with osteoarthritis and other forms of therapy should be considered to maintain maximal patient health and performance. Elizabeth G. Davis, DVM, PhD, Dipl ACVIM (Large Animal), is Associate Professor, Department of Clinical Sciences and Department of Anatomy and Physiology, College of Veterinary Medicine, Kansas State University, Mosier Hall, 1800 Denison Ave., Manhattan, Kansas 66506. USA. Article first published on Horsetalk.co.nz in June, 2009. 1. Foreman JH. Phenylbutazone and flunixin meglumine used singly or in combination (“Stackin”) in experimental lameness in horses. Proceedings, abstract submission #166 ACVIM Forum, Seattle, WA 2007. 2. Foreman JH. Does Stacking of Non-steroidal anti-inflammatories work? Proceedings ACVIM Forum, Minneapolis, MN 2004. 3. Goodrich LR, Nixon AJ. Medical treatment of osteoarthritis in the horse- A review. The Vet. J. Vol. 171, 2006 pp. 51-69. 4. Lees P, Landoni MF, Giraudel J, Toutain PL. Pharmacodynamics and pharmacokinetics of nonsteroidal anti-inflammatory drugs in species of veterinary interest. J Vet. Pharmacol. Therap. Vol, 27, 2004 pp. 479-490. 5. McConnico RS, Morgan TW, Williams CC, Hubert JD, Moore RM. Pathophysiologic effects of phenylbutazone on the right dorsal colon in horses. AJVR, Vol 69, No. 11, Nov. 2008 pp. 1496-2616. 6. Reed SK, Messer NT, Tessman RK, Keegan KG. Effects of phenylbutazone alone or in combination with flunixin meglumine on blood protein concentration in horses. AJVR, Vol 67, No 3, March 2008 pp. 398-402.